Wondering whether a provisional application is right for you? The USPTO might have the answer in this post. A provisional application provides the benefit of an earlier filing date. So protection, once a patent is granted, would extend back to the filing date of the provisional application. It also allows the filer to use the term "patent pending" as a warning to potential infringers, both deliberate and accidental. However, once a provisional application is filed, the filer has one year to file a nonprovisional application, or all such benefit will be lost. Furthermore, if the invention has been publicly disclosed in that time, the inventor might lose the right to ever patent the invention. 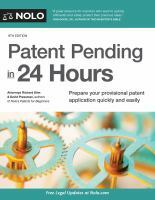 Stop by the Patent & Trademark Resource Center in Central Library to check out this book on provisional applications, and to pick up a copy of the USPTO's Guide to Filing a Provisional Application for Patent, to get started.